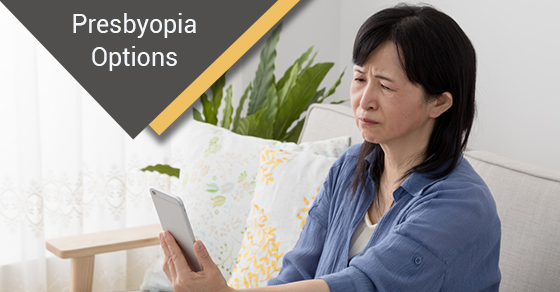 Presbyopia: What Are Your Options? Presbyopia is an age-related condition of the eye in which it becomes difficult to see things up close. Reading, for example, becomes difficult. This is due to the fact that our natural lenses become stiff as we age. Presbyopia typically sets in around the mid-forties, at which point reading glasses or bifocals usually become necessary. When it comes to treatment, there are several different options, but not all of these are equal. Some have distinct advantages over others. Take a look below. Kamra Inlay is a revolutionary device that makes it possible for those with presbyopia to see without glasses. The procedure is highly effective and safe. Kamra inlay treatment involves the placement of an opaque, round micro-disk, smaller than a contact lens, at the front of the pupil (and only in the non-dominant eye). The procedure is also reversible. To determine whether you are a candidate for this procedure and to read more about it, click here. A standard option for presbyopia is, of course, reading glasses (or bifocals depending on your vision). If you do not currently have any other vision problems (such as nearsightedness or farsightedness), reading glasses may be all that you currently require. Reading glasses correct close-up vision by bending light before it enters the eye. Reading glasses are an effective option for presbyopia, but come with the inconvenience of having to rely on glasses. For those with other vision problems, you may already wear eyeglasses, bifocals, trifocals or progressive lenses. Again, this is an effective option, but the cons are that you have to continue to rely on glasses to see, as well as pay for a prescription. Monovision—either via monovision contacts or refractive surgery—is another traditional option for presbyopia. The challenge with monovision is that only one eye is corrected for distance vision, while the other eye is corrected for close-up vision. You will need time to adapt, and it can affect things like your depth perception. The flipside is that you will get the best of both worlds, by correcting both distance and close-up vision. Others achieve monovision via refractive surgery, usually by reshaping the cornea via a laser in much the same way as mentioned above: sharp distance vision in one eye and sharp close-up vision in the other. The difference between surgery and contact lenses is that with surgery you will not need to rely on reading glasses or contact lenses. However, the same potential problems of depth perception still exist. If you are interested in the Kamra inlay treatment, consider Skouras Eye and Cosmetic Centre. We are one of the leading comprehensive eye care facilities in Toronto. To schedule a complimentary assessment or for more information, contact us here.